Saratoga Springs is a city in Utah County, Utah. It is part of the Provo–Orem, Utah Metropolitan Statistical Area. 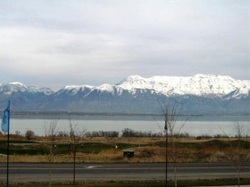 The city is a relatively new development along the northern shores of Utah Lake. It was incorporated on December 31, 1997 and has been growing rapidly since then. The population was 1,003 at the 2000 census, while the 2009 estimates placed it at 16,125, making it one of the fastest growing US cities during this time period. Although Saratoga Springs was a town in 2000, it has since been classified as a fifth-class city by state law. Saratoga Springs, Utah is approximately 35 miles from Salt Lake City, Utah. Saratoga Springs has grown rapidly with stores as well. Saratoga Springs offers a Walmart, Smith's, Jiffy Lube, McDonald's, Walgreens, Chevron, Checker-O'Reilly Auto Parts, Dollar Tree, and many other stores.